Fruit Halwa the famous sweet of Sri Venkateswara Boli stall at West Mambalam. Chennai people especially those who are ardent fans of these tiny chain of sweet and savory store would definitely not miss this delicacy. 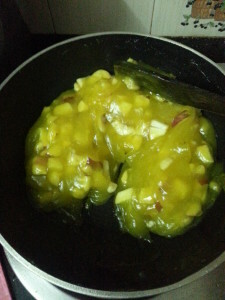 Fresh fruits like apple, banana, pineapple, grapes and pomegranate kernels are finely chopped and added to this halwa. 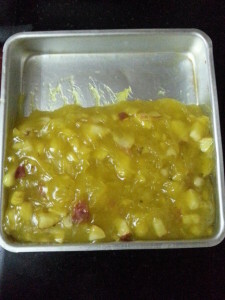 There are numerous variations in which this halwa can be made. 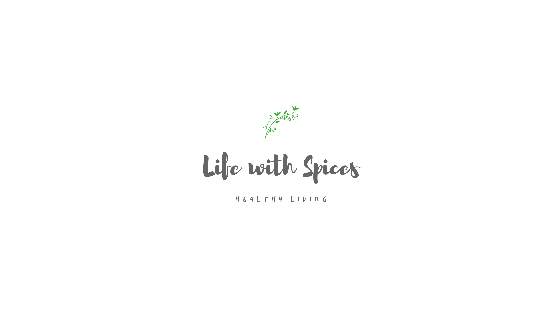 Fresh fruits can be skipped and dried fruits, candied fruits, dates can be added which will increase the shelve life of the sweet. No prior preparations are needed to make this sweet dish. If things are handy halwa can be prepared in less than 20 mins and Neivedyam will be ready for Pooja!! 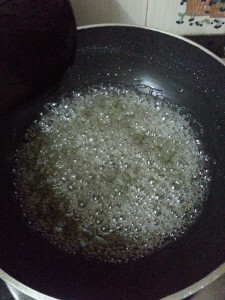 Take 1 cup water in a bowl add corn flour, food color (if you are adding) and mix well. Take 1 cup sugar to a non stick pan add sugar and bring to one string consistency (approx 7 - 8 mins) keep checking in between. 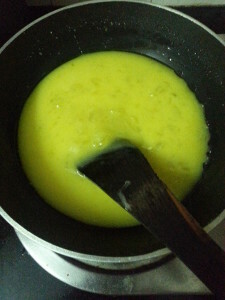 Once the consistency has reached bring to low heat add the cornflour mixture, ghee, pineapple essence to the pan and start stirring continuously. 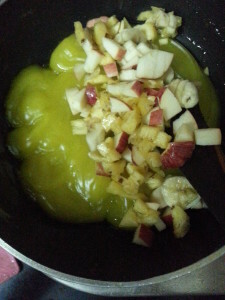 When they start to form a mass at this stage add fruits and add a tbsp of ghee and start mixing them. 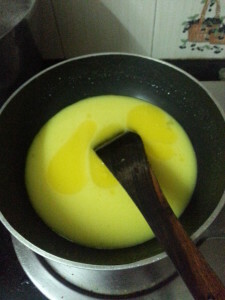 Once ghee starts to ooze out add chopped nuts mix well and transfer to a greased plate. Allow to cool and slice them. 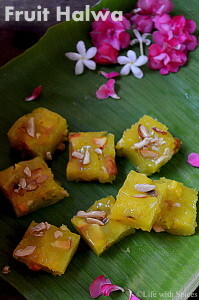 Perform the Pooja and relish on these yummy fruit halwa!! ** Fruits should be finely chopped. Watery fruits should not be added like melons. 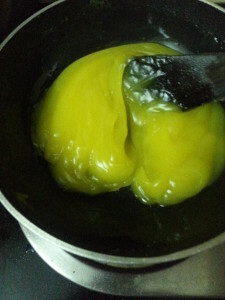 ** Ghee had to be added or else the halwa consistency will be lost and it will turn to be sticky. ** Corn flour can be replaced with Semolina / Dalia. Cook them and separately and add them. 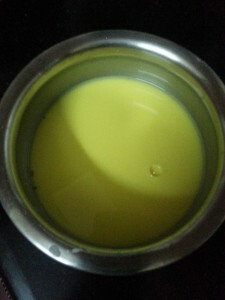 ** Greasing of the plate is a must with ghee.